Congrats to our winning entry by alohamom2three! GROOT! Check out her full project thread for this amazing project, and the challenge blog as well! EEP! October is here and we're ready to see all of the crafty costumes! Time to showcase all of those amazingly creative DIY Halloween costumes of this season. Each year, we've had the pleasure of viewing absolutely spectacular handcrafted costumes. And now we want to see yours! Once the challenge is completed, we'll move all of the entries to the Halloween board, so they can be easily accessed for years to come! The costume you enter must have some handmade components. It must be a costume you are making for this year (Halloween 2015), and not photos of a costume from past years. If you are making a costume for someone else, and not for yourself to wear, it's okay enter it, but just remember that you can only have one entry in this contest. If you are making a set of costumes for multiple people that all go together via a common theme, you can enter them together as one entry. Enter costumes crafted for Halloween 2015 only. Projects created before this timeframe will not be removed from the entry board, but they will be excluded from the voting poll. Each participant can enter ONE project (Although your entry can have multiple components to it). Post your craft during the period of Nov 2 - Nov 8 2015. No sooner. No later. On Nov 2, there will be a special folder created for entries. We will reply with the folder/board link here on this thread. Voting will happen from Nov 9 - Nov 16 2015. The winner will be officially announced on our first business Monday of the next month -- in our December newsletter, on this thread and on the Craftster blog. We will contact you via Private Message, after the announcement, to get your prize package information. If cheating of any sort is discovered, the applicable entry and votes will be disqualified. It's probably impossible to know whether your project is 100% original, has never been posted on Craftster or made by anyone else in the past. But if your project was definitely inspired by something you've seen before, please give credit to that project. 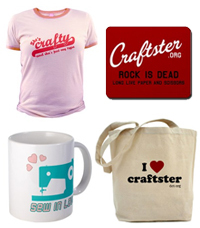 Their choice of any one item from one of Craftster's online shops OR a $25 Amazon Gift Card! My favorite challenge! I love seeing all the creative costumes. Yay! I love this challenge. Yay! Definitely one of my fave challenges! I would have loved to compete in this, but my girls wanted store bought costumes this year. It made me so sad But if anyone wants a really good idea I saw this adorable hedgehog costume for a toddler it was just so cute. I would love to see someone do this costume. OooOOooo! The results of this challenge is always so fun to see! If I can get good photos, perhaps I will even enter this year! BUT I WANT TO POST MY COSTUME NOW! Keep ya shirt on! Only a few more days! A) what if my costume doesn't have a shirt? B) I have already been waiting a few days! ACK! Immediate gratification is my right as an American! Craft Challenge #124 - Craftster Rocks! - Entries Due Aug 1 - 8 - BONUS PRIZE!